Reliance Jio has overhauled its existing plans for the post-paid and pre-paid users. The move seems to have been prompted by the slowing business for the company. Jio, which once added more than a million users a day, has seemingly fallen behind Airtel in the recent days when it comes to adding new subscribers to the network. With the refreshed plans the company must be not only hoping to gain more subscribers but also retain the existing ones. 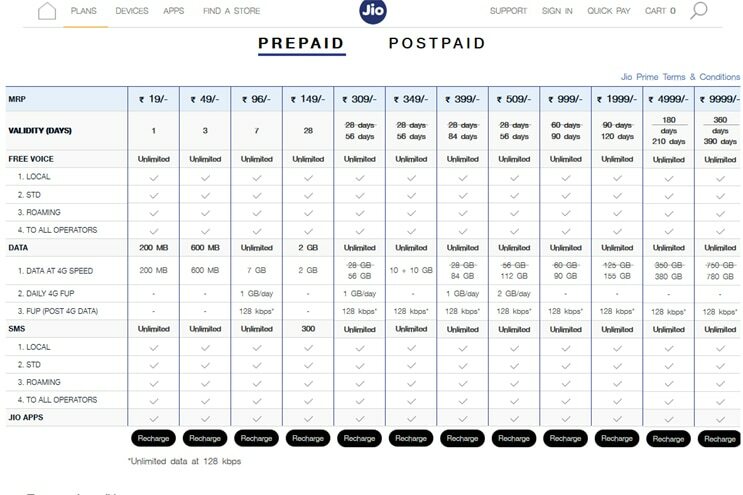 Here is what has changes for Jio users starting today, first let’s talk about the changed plans for prepaid users. Rs 309 Plan: Jio has extended the validity for this plan from 28 days to 56 days. The Rs 309 recharge gets you unlimited voice calls, SMS and unlimited data for 56 days with daily 4G FUP of 1GB per day and post that the speed is reduced to 12bkbps. In simple words you get 56GB 4G data for 56 days. Rs 349 Plan: The new validity for this plan is 56 days in oppose to the 28 days before. This recharge will get 10GB + 10GB 4G data for 28 days each. In case you have used the 10GB data within the 28 days then the internet speed will be reduced to 128kbps. Rs 399 Plan: The company has changed the validity of this plan from 28 days to 84 days. You now get 84GB 4G data with this recharge for 84 days. The FUP limit is 1GB per day and after that speed will lower down to 128 kbps. Rs 509 Plan: The new validity for this plan is 56 days. Subscriber will get 112GB 4G data for 56 days with this recharge. The FUP limit is 2GB per day and post that the internet speed will be reduced to 128 kbps. Rs 999 Plan: The old validity for this plan was 60 days and now the company has extended it to 90 days. There is no FUP limit and once you use the 90 GB 4G data that comes with this plan, your internet speed will go down to 128 kbps. Rs 1999 Plan: The plan is now valid for 120 days and will get you 155GB 4G data along with unlimited calls and SMS. The internet speed reduced to 128kbps but continues to work even after the limit is exhausted. Rs 4999 Plan: While this plan came with 180 days validity previously, after the overhaul it now comes with 210 days validity. The amount of 4G data has also been increased from 350GB to 380 GB. Rs 9999 Plan: With the new changes, this recharge comes with a validity of more than a year now. While earlier it was 360 days, Jio has now extended it to 390 days for the users. The 4G data limit has also been pushed from 750GB to 780GB. Rs 309 Plan: The new validity of this plan is for 2 months. User will get 60GB 4G data with daily 4G FUP of 1GB per day and unlimited data at 128kbps. Rs 349 Plan: Jio has extended the validity for this plan from 1 month to 2 months. Rs 399 Plan: The plan is now valid for 3 months and users get 90GB 4G data with this recharge. Unlimited data at 128kbps once the 4G data limit has reached. Rs 509 Plan: The new validity is for 2 months and user gets 120GB 4G data with daily 4G FUP of 2GB per day. Rs 999 Plan: The plan will now run for 2 months with one time recharge and get you 90GB 4G data with no FUP limit.